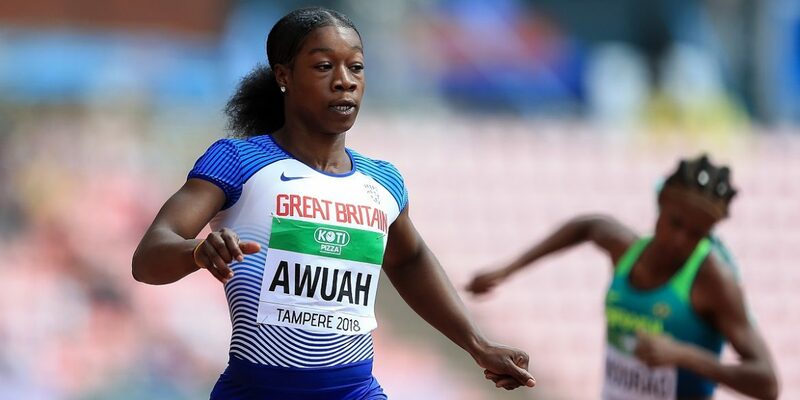 There was a sensational run in the German capital by World Junior medallist Kristal Awuah (coach: Matthew Thomas; club: Herne Hill Harriers) as she smashed her personal best with an 11.16 (-0.1m/s) run to win the B 100m. That run puts her third on this year’s Power of 10 rankings, but more importantly moves her second on the all-time British junior rankings, just 0.02 of a second outside Dina Asher-Smith’s British junior record. In the A race Daryll Neita (Jonas Dodoo; Shaftesbury Barnet) was fourth in 11.24 (-0.3), just 0.05 shy of her season’s best. In the endurance events Rosie Clarke (David Harmer; Epsom & Ewell) produced a solid 9.40.00 run for tenth in the 3000m S/C, whilst Scottish duo Eilish McColgan (Liz McColgan-Nuttall; Dundee Hawkhill) and Steph Twell (Geoff Wightman; Aldershot, Farnham & District) were fifth and sixth in the women’s mile in 4.25.07 and 4.26.05 respectively, McColgan’s time a personal best. In the rarely run 1,000m Jemma Reekie (Andy Young; Dundee Hawkhill) and Laura Weightman (Steve Cram; Morpeth) were fourth and sixth in times of 2.37.25 and 2.37.56 respectively. Dewi Griffiths (Kevin Evans; Swansea) produced an impressive winning performance at home in Wales on a revised, quicker Cardiff 10k course. He went out very aggressively, passing 5km in 14.14, suffering slightly in the latter stages but still bringing it home in 29.10. In the end Cardiff AC man Matt Clowes (Cardiff) wasn’t far back, his 29.19 time a 10 second personal best. In the women’s race Lily Partridge (self-coached; Aldershot, Farnham & District) made up for the disappointment of being forced to drop out of the European Championships marathon with a 90 second victory, breaking the tape in 33.27. Marc Scott (Jerry Schumacher; Richmond & Zetland) continued his outstanding recent form as he pushed the pace all the way to win in 28.57 on the quick Manchester course, a road personal best, putting him third on the Power of 10 rankings for 2018. Andrew Butchart (Terrance Mahon; Central) returned from injury to finish second in an encouraging 29.28 time, whilst Jessica Piasecki (Mick Woods; Stockport) won the women’s race in 32.52 to go fourth on the Power of 10. Adelle Tracey (Craig Winrow; Guildford & Godalming) took a solid third place in the women’s 800m in 2.01.26, whilst in the women’s mile Hannah England (Bud Baldaro; Oxford City) was fifth in 4.34.00, not far outside her personal best. Keely Hodgkinson (Margaret Galvin; Leigh) was one of a handful of athletes to break School Games records on two exciting days of competition at Loughborough University, the youngsters making the most of the good late season conditions. Hodgkinson produced a stunning gun-to-tape victory in the girl’s 800, stopping the clock at 2.04.89 to cap off a fantastic season that saw her win the European Youth title. In the men’s equivalent Max Burgin (Brian Burgin; Halifax) also bettered the old mark with a similarly dominant piece of front running, stopping the clock at 1.50.00. In the field, Lewis Byng (Paul Bearman; Stratford-upon-Avon) and Nana Gyedu (Cambridge Harriers) set new shot put records, Byng producing an incredible throw of 19.05m to complete a stunning season where he also won gold at the England Athletics Championships, English Schools and SIAB International. Gyedu had a great series, consistently throwing over 15 metres, with a final mark of 15.69m smashing the old record by the best part of a metre. That distance also improves her personal best by the best part of a metre. Max Law (Sam Harrison) was another field eventer on form, throwing 73.40m in the javelin, just 5cm shy of the Games record. Morgan Squibb (Andy Frankish; Blackheath & Bromley) was the final record breaker in the girl’s 1500m steeplechase, chopping four seconds off the previous mark with a 5:01.06 run. Sammi Kinghorn (Ian Mirfin) made a return to the track in Coventry, her first races since the Commonwealth Games in April. The two-time world champion had a busy two days as well, competing across five different distances, as well as mentoring athletes both there and at the School Games in Loughborough. Over 100m, she clocked 17.38 (-0.9) while it was 28.61 (+1.1) in the 200m. Over the 400m, it was 57.45 while in the 800m she recorded 1:59.30. Over the longest distance of the weekend, she pulled one of her fellow competitors to their best ever time. 4:11.54 rounded off her competition.